It is old news that by the time young women enter the workforce, many are at a distinct and daunting disadvantage in mathematics, engineering and other technical fields. Realizing that the experiences girls and women have from early childhood through college will influence their trajectory for years to come, parents, educators, entrepreneurs and young innovators are now striving to lay a sounder foundation for future generations. What drives a six year old girl’s belief that she may not be as smart as the boys, and what can be done to break that debilitating pattern? What role can games - from blocks to video and storytelling - play in instilling confidence in growing minds? Why are some computer science programs attracting and graduating far greater numbers of women than others? Why ask "why" before "how" when teaching a new skill? 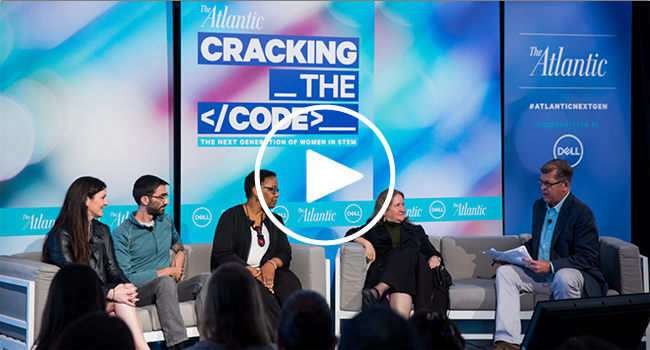 In this Atlantic forum, we brought together educators, thought leaders, students and creators re-thinking from the ground up what it means to raise and become a woman in STEM.